Walker was selected as mayor at her first meeting. "This is a unique time in history and it presents an unprecedented opportunity for Charlottesville to move beyond the illusion of being a progressive, utopian village and roll up its sleeves to restructure and create a community where all citizens are able to thrive. Charlottesville has for too long, hidden behind its physical beauty and lofty intentions. Too many of us have remained unwilling to discuss the duality of this city. While the place is aesthetically charming to the outside observer, it clearly lacks that same appeal on an internal level. Charlottesville is a resource rich community, yet those resources have failed to close wealth, education and health gaps. In an area where the University of Virginia is a blink away and philanthropists --from the Dave Matthews band to local groups and individuals, make generous contributions with hopes that their donations will fuel ongoing positive change, we continue to live in a city that tells a vastly different story depending on the narrators' race and economic status. During years of working in social services and as a social justice advocate, I have witnessed the well-intentioned, genuine efforts of our city's philanthropists become nothing more than a business of maintaining middle and upper middle incomes. Charlottesville's narrative is currently mired in duplicity and muddled in “alternative facts.” Yet, the city is full of capable people with the passion required and the level of commitment necessary to unmask the illusion and change our narrative." ↑ Web. Walker seeks independent bid for Charlottesville City Council, Sean Tubbs, News Article, Charlottesville Tomorrow, March 14, 2017, retrieved March 17, 2017. ↑ Web. 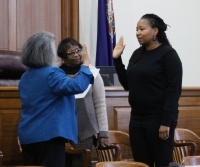 The unmasker: Nikuyah Walker makes independent bid for City Council, Lisa Provence, C-VILLE Weekly, Portico Publications, March 22, 2017, retrieved March 22, 2017. This page was last edited on 3 January 2018, at 15:33.